The first nanobot assembly line has been created by researchers, according to A proximity-based programmable DNA nanoscale assembly line, a paper published in Nature. The "nanobots" are molecular machines made from strands of DNA; they can "carry" different sizes of gold particles to create up to eight different products. Our ability to synthesize nanometre-scale chemical species, such as nanoparticles with desired shapes and compositions, offers the exciting prospect of generating new functional materials and devices by combining them in a controlled fashion into larger structures. 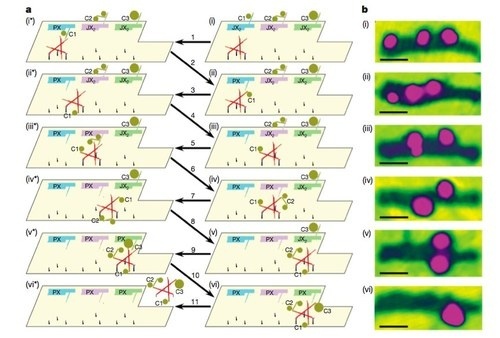 Self-assembly can achieve this task efficiently, but may be subject to thermodynamic and kinetic limitations: reactants, intermediates and products may collide with each other throughout the assembly time course to produce non-target species instead of target species. An alternative approach to nanoscale assembly uses information-containing molecules such as DNA1 to control interactions and thereby minimize unwanted cross-talk between different components.